Do you want to know the keys to moving from a prayer wimp to a prayer warrior? Would you like to pray more? Better? Stronger? With more fire, faith, and fervency? Join Max Lucado and thousands of others around the world, praying every day for four weeks! The Before Amen Prayer Challenge is simple: 4 minutes praying every day, for 4 weeks, and it will change your life forever. 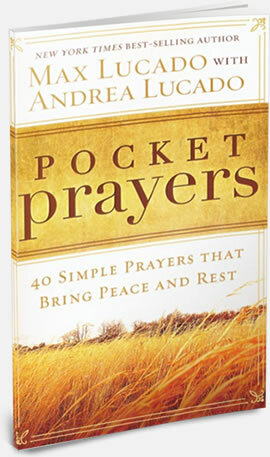 When you sign up you'll receive the FREE eBook, Pocket Prayers: 40 Simple Prayers That Bring Peace and Rest by Max and Andrea Lucado. This 64-page booklet includes 40 pocket-sized prayers written by Max and Andrea Lucado specifically for times of uncertainty and turmoil. It will help you find peace and rest during difficult times and is ideal for passing along a message of hope. Step 1: Set aside a time each day where you can pray for 4 minutes. In 4 weeks, that’s just 28 days, you will have formed a new prayer habit that will change your life. Step 2: Pray with confidence. Inside the FREE Pocket Prayer book, you’ll find prayers for 40 days - prayers that will help you engage with God at a whole new level and prayers for when you’re just stuck and don’t know what to pray. Step 3: Keep going. During your 4-week challenge, you may be tempted to quit. To help you stay the course, we will send you weekly emails written by Max Lucado designed to encourage you on you on your prayer challenge. Step 4: Share this Prayer Challenge with your friends. By sharing, you will help others improve their prayer life and perhaps find some accountability partners in your prayer walk.